One sense of the word “right” as found in the Oxford English Dictionary. Apparently some people somewhere are laboring under the idea that “right” in the sense of “correct” can only be an an adjective. But “apparently” isn’t good enough for me, so I dug into the reference books. According to the OED, the foremost authority on the history of the English lexicon, “right” has had an adverbial sense meaning “correctly” since the year 950. That’s not 1950, that’s 950. As in more than a thousand years ago. So right there we know this “rule” is bogus. But where did it come from? Maybe a little further back? My 1935 “English in Action” coursebook states: “slow, loud, quick, fast, cheap, right, wrong, clear, ill, well, hard, high, long, and deep are used as adjectives or as adverbs.” No proscription here, either. 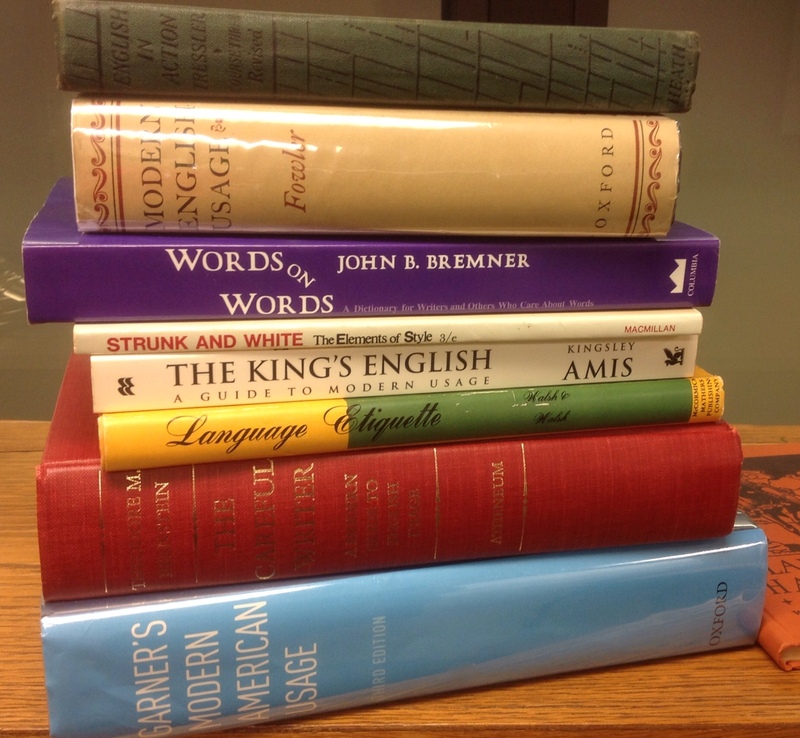 Some of the language books I consulted for this post. So I kept looking. I have literally dozens of grammar and usage books in my office whose publication dates span more than a century (this is my job, after all). Not one — not Bremner or Bernstein, not Garner, not Strunk and White — even mention this rule to debunk it, much less perpetuate it. However, I did run across a couple of queries in online forums about whether it’s acceptable to say “done right” instead of “done correctly,” leading me to think that someone out there is telling people that the “right” one is wrong. Does anyone have any insights into where this came from? If so, I’d be glad to know. When I was writing text that was going to be translated into multiple languages, I learned to use “correctly” instead of “right” because “right” had so many meanings that it could be translated incorrectly. And I suppose in some situations, “right” could be construed as the opposite of “left” and not the opposite of “incorrect.” (“I think I turn left at the next intersection.” “Right.”) Someone may not have understood that such a “rule” isn’t to be applied universally. Thanks! That makes sense given that you know how a text is going to be used. Judging from where I’ve encountered this “rule,” though, it’s not confined to translation. And you’re right — there are always people who don’t get that some language guidelines aren’t to be set in stone. MWDEU is helpful on this. In its entry on flat adverbs (of which right is an example), it says 18th-century grammarians like Lowth, Priestley and Murray considered flat adverbs inexplicable and argued that adverb forms should always add -ly. The Latin grammar they so admired gave them no model for the same word being both an adjective and an adverb. “‘Wrongly’ occurs in such contexts, but it is less common than ‘wrong’. It concludes that you should rely on your own grasp of idiom and your sense of what sounds right. A bibliographic note: Your “1944 edition” of Fowler is, I believe, just a later printing of the original 1926 work, so for chronological comparisons its content dates to 1926. The other editions, AFAIK, are the 2nd (1965, ed. Ernest Gowers) and 3rd (1996, 2004) ed. (extensively) by Robert Burchfield. Good to know, thanks. That means I have all three!